Hi, my name is Tommy Landry. I’m glad you stopped by “The Hub”. I’ve been a bass player my whole life, for the most part. As many of us do, I started out on some rather low quality basses, hoping to later upgrade once I better learned my craft. At the time, I really thought that was the only way to go. Instrument costs and quality have begun to look a lot different than they did 10 or more years ago. You can get great deals on quality, brand new fretless basses if you know where to look. I’m here to take some of the work out. Having bought equipment online in the past, I can attest to the fact that research is difficult and time consuming. To date, there has been no true site or community dedicated specifically to the fretless bass guitar community. Now there is. Join me as I work to sort this all out. 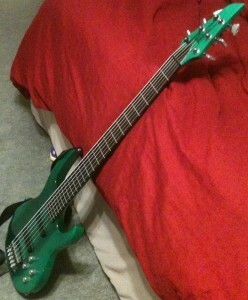 And just for fun, I’ll be adding some pics of my basses. Email me at tommy (at) fretlessbassguitarsite (dot) com if you want to submit cool pics of your own, let me know why you think they are cool, and I’ll include any good ones on the site! Here’s one rough pic I took on my iPhone. Not the clearest, but you can get a good feel for my baby! This is a Carvin 6-string fretless, purchased during 1994 and still sounding as wonderful as the day it was bought! And yes, I needed the fret lines when I first bought it (first 6-string bass I had ever owned). Now, I love it so much that I simply won’t move on to a newer or nicer model.